The VeSyMA – Motorsports Library is a motorsport focussed part of the VeSyMA solution. This library delivers components, systems and experiments that are specific to motorsport applications and is used by customers in Formula 1, NASCAR, IndyCar and many other race series. 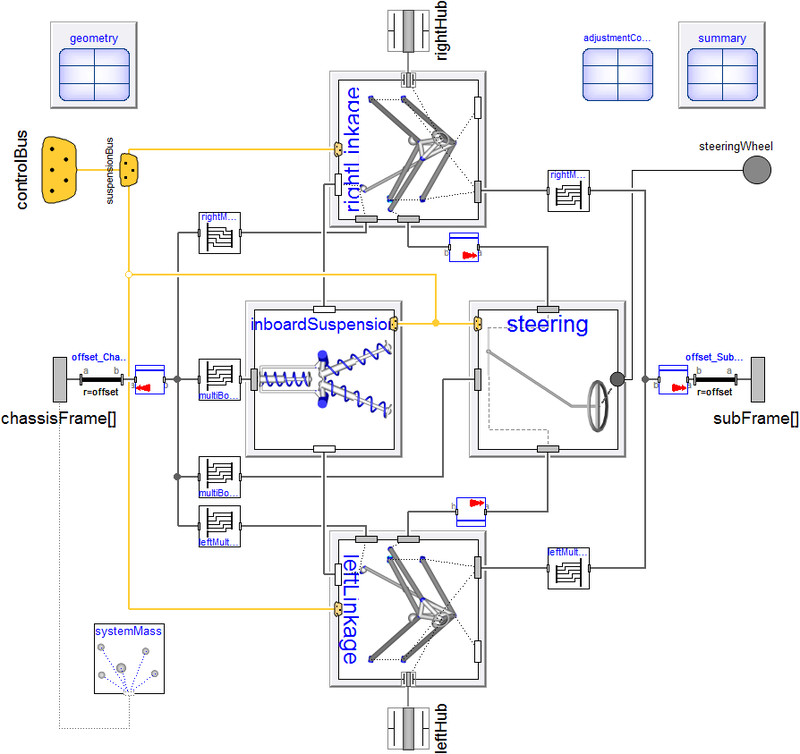 The combined use of VeSyMA – Motorsports, other Modelica libraries and Dymola can fulfil an organisations desire to use the same vehicle model across the all parts of the engineering process including in the design office, for HIL testing, integrated in track side tools and in the driving simulator. This is because the same model can accurately predict vehicle behaviour and run in real-time without a need to significantly reduce its fidelity. 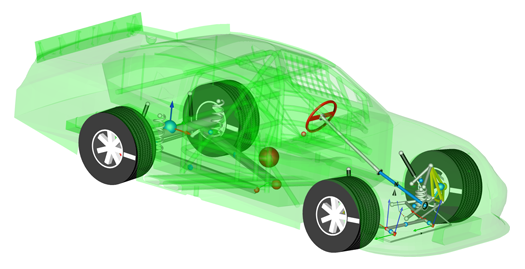 VeSyMA – Motorsports is fully compatible with the rest of the VeSyMA solution suite, including VeSyMA – Suspensions, enabling the models to be used in the standard test rig and experiments from these libraries. The models and templates within the library are highly customisable and extensible, and in combination with multi-domain nature of Dymola, this makes a flexible modelling environment for the user. 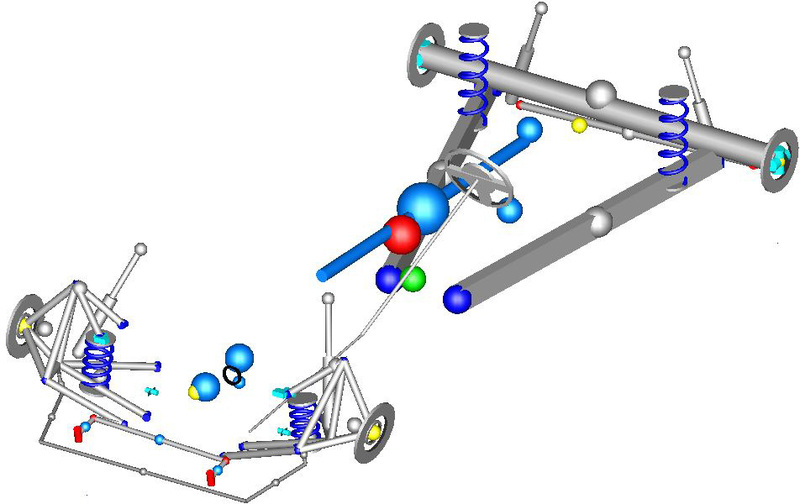 Double wishbone suspension models with either pushrod/pullrod or direct spring actuation. Kinematic models with optional compliance in uprights, tie rods, anti-roll bar links, pushrods, inboard mounts. The suspension mechanisms include a full range of adjustment shims, applied in a physically realistic manner by defining shim sizes. Setup calculation experiments give a convenient method for determining the adjustments required for a desired vehicle setup. Pacejka tyre models which incorporate tyre pressure and aerodynamics effects. A number of aerodynamic models are available to implement the body and wing aerodynamic effect on the chassis. 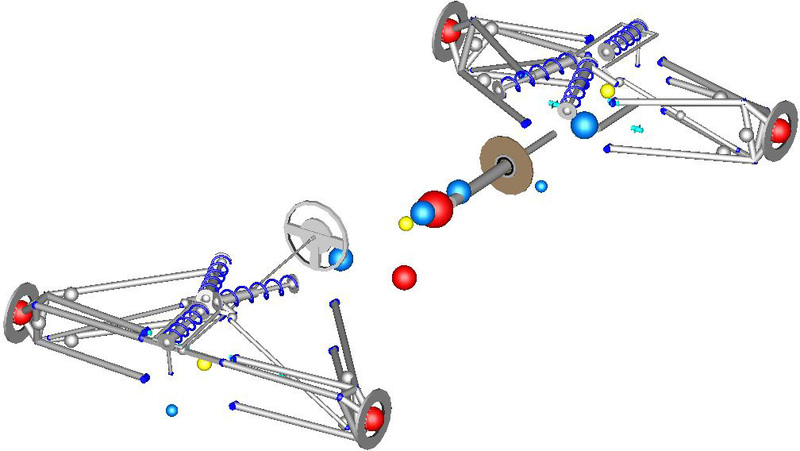 Access to all the experiments and driver models available in VeSyMA – Suspensions. 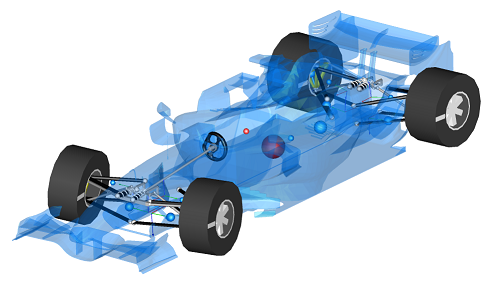 The VeSyMA – Motorsports Library provides a comprehensive collection of double wishbone suspension configurations for open-wheel racing applications such as Formula 1, IndyCar and similar vehicle configurations. The models include options for pushrod and pullrod actuation with numerous inboard suspension arrangements. The inboard suspension models comprise combinations of ride springs, dampers, heave springs, monoshock, inerter and anti-roll systems as well as the rocker mechanism. These optimised suspension models enable real-time running without additional detailed work by the user. All the suspension models supplied in VeSyMA – Motorsports feature a full range of adjustments, which are implemented in a physically realistic manner by the addition of adjustable size shims. The mechanisms also include spring preload adjusters. Setup calculation experiments will automatically determine the adjustments and preloads necessary to achieve a specified setup target. Geometry records are used in the suspension models for convenient parameterisation through a single interface. The library provides a simple tool to easily allow the setup results to be captured into a new geometry record. This method allows the user to quickly change the geometry and setup applied to a vehicle model. VeSyMA – Motorsports includes support for NASCAR where the front suspension model is a double wishbone suspension with outboard springs and dampers but using the same optimised real-time capable model as the other versions of the library. The rear truck arm suspension model has been developed and optimised to be real-time capable. 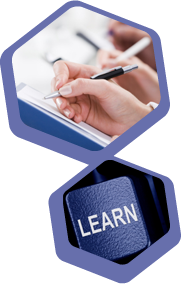 The library includes generalised setup procedures with methods to enable the customisation of the experiments to tailor them to match your own teams process. These experiments allow the tuning of corner weights, frame heights and wheel angles (toe and camber). For sports car racing and high performance applications the library provides double wishbone suspension configurations with direct acting springs, dampers and anti-roll bars. All the suspension models supplied in VeSyMA – Motorsports feature a full range of adjustments, which are implemented in a physically realistic manner by the addition of adjustable size shims. The mechanisms also include spring preload adjusters. Setup calculation experiments will automatically determine the adjustments and preloads necessary to achieve a specified setup target, these are available for both half car and full chassis models. Geometry records are used in the suspension models for convenient parameterisation through a single interface. The library provides a simple tool to easily allow the setup results to be stored in a new record. This method allows the user to quickly change the geometry and setup applied to a vehicle model. This library provides vehicle body models specifically for motorsports applications, which include ballast locations and aerodynamics models with separate body, front and rear wings. The aerodynamic examples use either single coefficients or lookup tables for convenient parameterisation, but the templates and components can be used and modified should a more complex aerodynamic model be required. 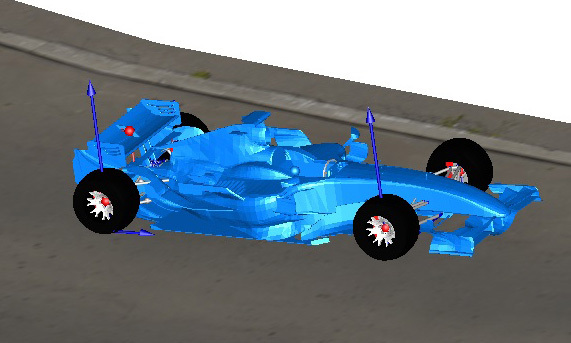 Simulating the 2014 Formula 1 car. Dempsey, M., Fish, G., Picarelli, A., Using Modelica models for Driver-in-the-loop simulators.Munich, Germany: Proceedings 9th Modelica Conference, 2012.